Home » Type » Animation » Stickers That Move! http://www.line-stickers.com/ – Stickers That Move! Line Sticker | Beat Takeshi brings the writing and Sakura Momoko brings the illustrations in these animated stickers from Calbee’s Hitokuchi Theatre. Friend the Calbee Hitokuchi Theatre official account to get them! Available till November 10, 2014. 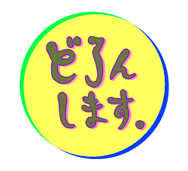 Name LINE Sticker: Stickers That Move!